If you have a chronic illness, you’re probably tired of hearing the “expert” opinion of random people. Living with a chronic illness (or several) is hard. But dealing with people who seem to take joy in blaming you for your condition is even worse. From people blaming “toxins” (whatever that means) in your food to people telling you that you need to get up and move when your joints don’t work, it’s kind of hard to maintain a positive attitude when you live with a chronic illness. And I totally get it. Folks, here’s the deal. Yes, I have chronic health issues. Yes, I hurt all the time. And I can sit and mope about it, or I can go on with my life and concentrate on the good things. I choose the latter. Some days are tougher than others. I’ve had two days in the last three years that I couldn’t get out of bed because the pain was so great (that’s when doctors suspected rheumatoid arthritis. And after a positive test, all the symptoms, and a family history, they still said I don’t have it. Go figure). I try to stay active, but some days I have to listen to my body and say that it’s a rest day. This rarely happens, as I’m usually able to adapt my workouts to my abilities on any given day. And that’s what you should do as well, if you’re dealing with chronic health conditions. Before I became a writer, I was a registered kinesiologist. My job at a local health centre was to develop, deliver, and evaluate a progressive exercise program for persons with chronic health conditions who had never exercised or who rarely exercise. The entire time I taught this program, I emphasized that the clients needed to listen to their bodies each day, and do what their bodies allowed them to do. When you have chronic health conditions, listening to your body becomes extremely important. This is even more important if you have conditions that affect your joints. Unfortunately, my arthritis has left me with little cartilage between the joints of my knees, as witnessed by the pain and loud noises as I go up and down stairs. This means that running is ultra contra-indicated for me, and I’ve had to officially hang up the triathlete part of my personality. The toughest part of having a chronic health condition isn’t having to give up some of the things you love (like triathlons). It’s having to deal with people who immediately become health and nutrition experts the minute they hear you have a chronic health illness, and want to diagnose and/or treat you on the spot. It’s very tiresome. Perhaps without knowing it, they’re in fact telling me that it’s my fault that I have these conditions. Apparently, a gluten-free diet will cure everything, and the cartilage that has worn away between my joints will magically remake itself the minute I take up yoga. Such nonsense isn’t only useless advice, it’s also hurtful: you’re indirectly telling me that I gave myself these symptoms because of what I eat or what exercise I do or don’t do. And it’s a pain in the behind. 1. Having a chronic illness is not your fault. For many chronic health conditions, a direct cause is not known. But what is known is that most chronic illnesses are NOT lifestyle diseases. It is not your fault. And if anyone starts trying to give you unwanted advice, it’s OK to gently let them know: “I will discuss this with my health care provider.” And leave it at that. Whether or not you actually discuss ridiculous claims with your health care provider is up to you. The point is that you don’t need to listen to people who want to blame you for your illness. 2. If you have a chronic illness, listen to your body. Ignore everyone else. I get up ad I move, despite my pain, every day of my life, and have been doing this for years. If there is a day I can’t get up, trust me, I actually can’t physically get up. If you have a chronic illness, don’t listen to people who don’t understand what you feel. Listen to your body and respond accordingly. If there are days when sitting down is all you can do, then sit down. If you’ve committed to an exercise program but need to bring the intensity down when you’re having pain, do it. And if people judge you for taking care of your body, I know it’s hard, but ignore them. The best way to stay active when you’re dealing with chronic health conditions is to adapt workouts as needed, depending on how you feel each day. This is extremely important—more important than pleasing those who don’t understand. 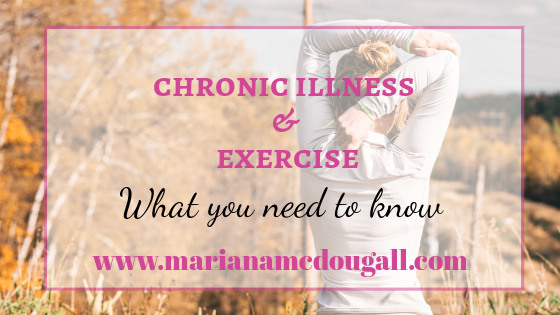 Remember to also discuss your exercise programs with your doctors, specialists, and preferably, a registered kinesiologist or certified exercise physiologist—people who actually have training in exercise prescription for persons with chronic health conditions. Depending on your particular condition, there may be contra-indications to certain exercises. It’s beyond the scope of this post to go into every contra-indication for every single condition (we’d be here for centuries), so do talk to a specialist before starting a new exercise program. In the meantime, try to ignore the well-meaning comments, listen to your body, and do what’s right for you to stay active as much as your abilities will allow. Thank you so much for your thoughts and honesty not to mention wisdom. I too suffer from several chronic pain illnesses and am up everyday running a household and working full time. I do have days i can not get up and my family all know that it must be bad if mom is still in bed. Thank you for sharing your experience. I completely understand running a household, working full time, and dealing with the pain associated with chronic health issues. I’m so thankful that you do listen to your body and give it the rest it needs on the bad days, and that your family understands this need. I wish you many more good days.